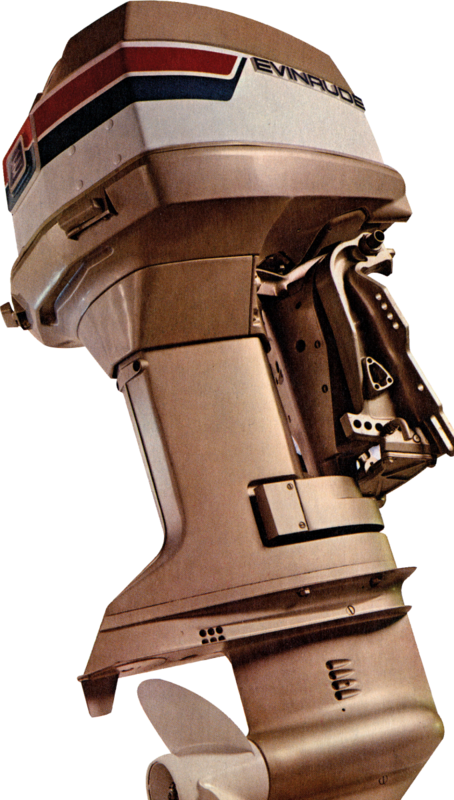 Over the years, the Evinrude outboard became a setpiece of pure Americana. 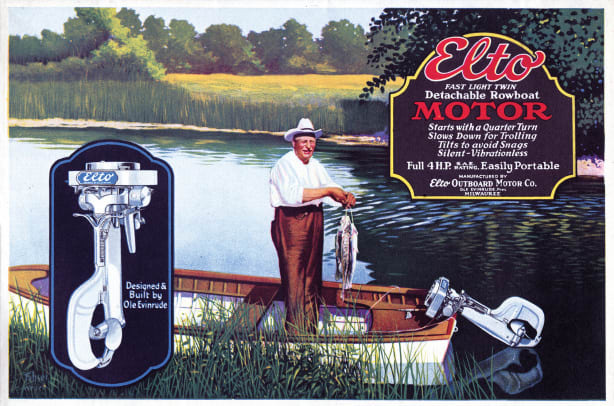 The Elto Company and Johnson Motors merged with Evinrude in 1929. In the early 1960s when I was a kid, my family owned a cottage—or what we used to call a “camp”—on a spring-fed lake in the Adirondack mountains. The place was a small, clapboard affair that had been handed down to us by my great grandfather Charlie. Grandpa Charlie was an interesting old guy. During his youth, before settling down to a lifetime of guiding “sports” on and around the lake via a stable of canoes, rowboats and small, inboard-powered skiffs, he’d spent several years adventuring out West, doing everything from running the Big Muddy in a raft to living cheek by jowl with the iconic Western painter and sculptor Frederic Remington in a sod hut in the Dakotas. He’d had the opportunity, family legend had it, to attend Harvard University for four years, all expenses paid, but had turned the offer down, deciding to catch the last of the American frontier instead. 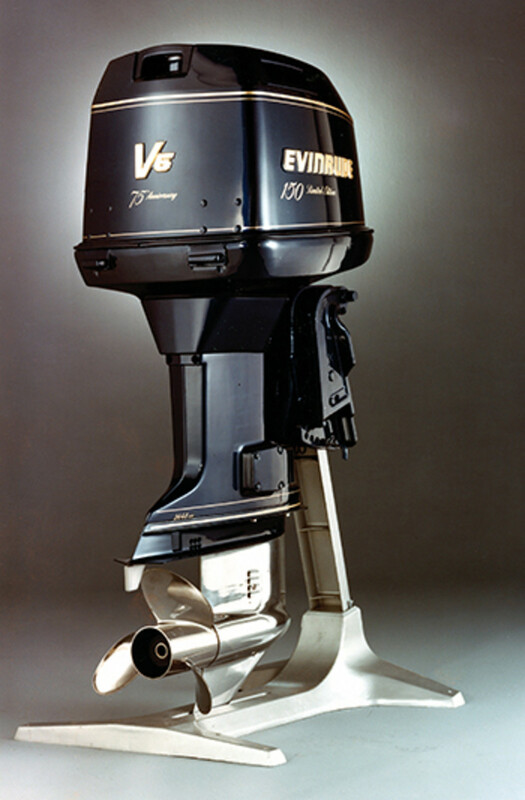 Small outboards were Evinrude’s forte in the beginning. Rope-start motors were common, although effective, safe rope-start technique required a bit of a learning curve. My family had a stable of boats on the lake as well. And the queen of the fleet was a riveted-aluminum speedster with a rakish, multi-hued, 40-hp Lark II Evinrude outboard on her transom. And man, would that baby go! in fact, the whole family did. Back then, Evinrude—and its parent company Outboard Marine Corporation (OMC)—were the big dogs in our neck of the woods. Not only was OMC selling more outboards than anybody else in the western Adirondacks, it was selling a raft of other products that were rather Adirondacky as well, like snowmobiles and chainsaws. 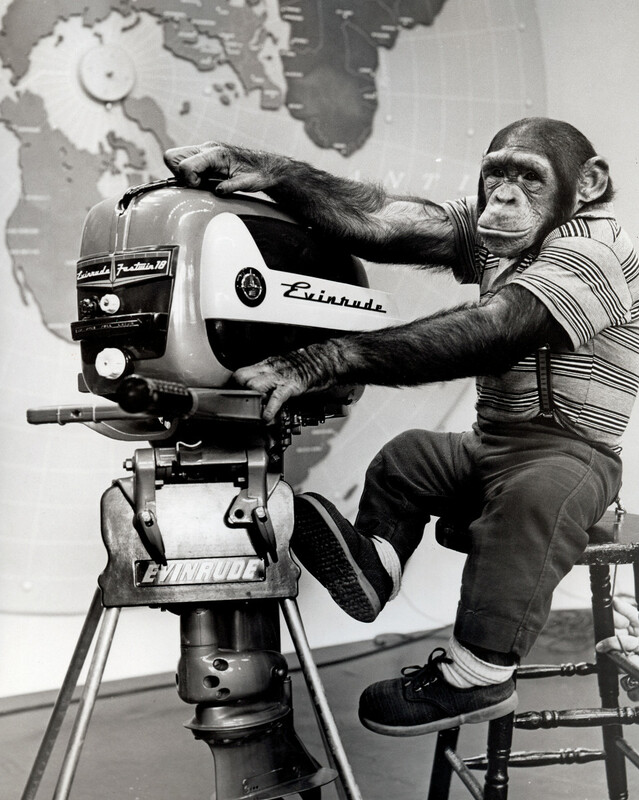 Zippy the Chimp was all the rage during the 1950s. He appeared on the Ed Sullivan Show, the most popular variety program on TV at the time. Obviously, Zippy made at least one promotional appearance on behalf of Outboard Marine Corporation as well. 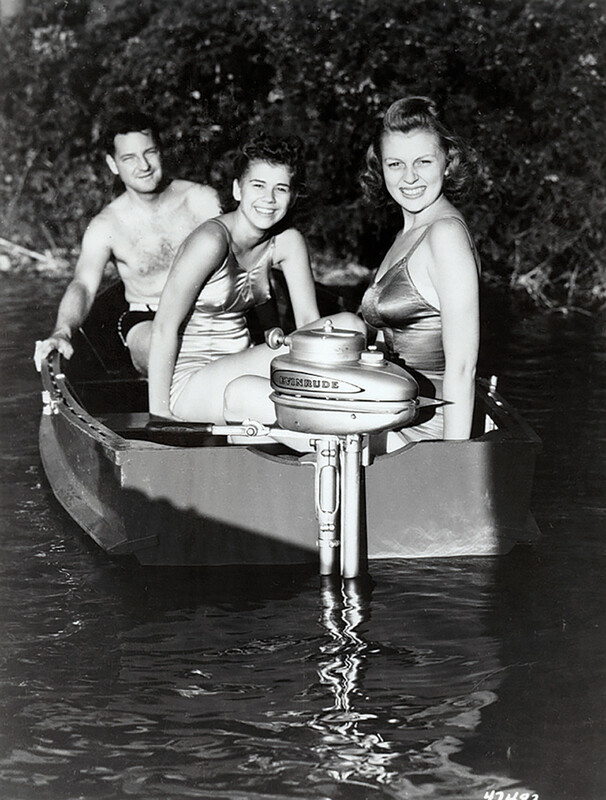 Ask my dad and he’d tell you, Evinrude was tops—the best money could buy, the absolute essence of top-shelf engineering and manufacturing, with major components like crankshafts, pistons, carburetors and electrics all created and assembled in the good ol’ USA, under quality-assurance mavens with eyes like hawks. And should, by some inconceivable stretch of the imagination, anything ever go wrong with his Evinrude Lark II, dad had a dealer right across the lake. I’d say I loved that Lark II as much as dad did. To this day, I can recall with crystal clarity the allure of its sweet, internal-combustion scent as we idled around the edges of Wintergreen Bay. And I can recall just as clearly the wild, steady, wonderful thrum it made at wide-open throttle as I zoomed across the open water of the lake proper, with a delicious, frothy-white contrail stretching out behind and the wind in my face. To say that that trusty old Evinrude figured as a guiding force in my life—a sort of governing presence—is no exaggeration. Not even close. That’s Ole Evinrude demonstrating one of his early products. Ole’s wife Bess said she thought it looked like a coffee grinder. Whether you own a boat, use a boat, build boats or just hang around boats for the heck of it, you’ve undoubtedly heard about how Ole Evinrude invented the outboard motor. You remember how the tale goes, right? The year is 1906, it’s Sunday afternoon, Ole’s a young, romantically inclined, Norwegian-born mechanical savant with some serious machine-shop expertise, an interest in horseless carriages and a potentially lucrative deal lined up with the U.S. government to build a passel of small, portable internal-combustion engines for reasons, to my knowledge, unspecified. He and his fiancé Bess Cary are picnicking on an island in the middle of Wisconsin’s Okauchee Lake when Bess announces she’d like some ice cream. So, off goes Ole, ever the dutiful prospective husband, in a rowboat. But on the five-mile return trip in sweltering 90-degree heat, he is constrained to turn inventive. Hmmm, he thinks to himself, too bad I don’t have one of my little engines somehow propelling this sucker. It’d be way easier and way faster than these oars. This ice cream is gonna turn into a puddle of soup before I get back to the island! The shop floor at Evinrude’s Sturtevant facility, not far from Racine, Wisconsin. The conclusion of the tale’s a matter of record. Three years later, Ole sells 25 outboards—his entire inventory at the time—in one day and takes orders for 10 more. Each of the little jewels generates 1.5 horsepower, weighs roughly 62 pounds and costs $62. But hey, the question arises now and again: Is the ice cream story really true? Well, for the most part, yes—it seems that way. But over the years, its veracity has been challenged. For example, a few decades ago, if you wanted to really enrage Carl Kiekhaefer, the founder of Mercury Marine—Evinrude’s main competitor throughout most of the 20th century—all you had to do was mention Ole Evinrude, rowboats and Ole’s supposed ice cream-inspired invention. 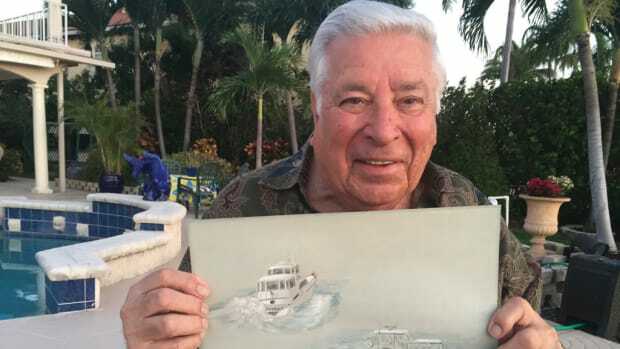 More to the point, in the early ’50s, Kiekhaefer, who as a young engineer was fired from Evinrude “for frequent, disquieting and brazenly insubordinate arguments concerning design and product development,” hired investigators to dig into the ice cream tale. Then afterwards, he claimed they’d thoroughly debunked the darn thing and specifed a rip-roaring ad campaign to make sure the outboard-buying public heard the truth, Mercury-style. 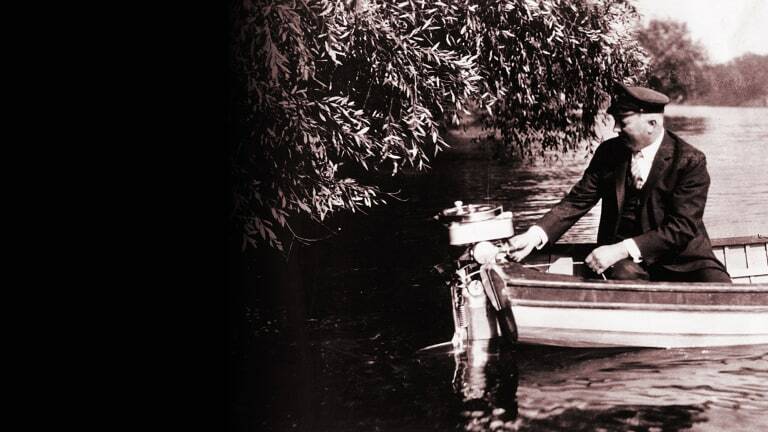 A guy named Waterman, Kiekhaefer always maintained, was the real inventor of the outboard. These two-stroke Evinrude 300-hp E-TECs pushed this SeaHunter Tournament 35 to a whopping 56 knots. Not bad, eh? After founding Evinrude Motors of Milwaukee in 1907, Ole and Bess (who was the author of the catchy advertising slogan “Don’t Row! Throw the Oars Away!”) built the company into a commercially viable operation that eventually began to thrive despite business-related machinations, mergers, non-compete clauses and buyouts. Innovation was always key, even as the country slogged into the Great Depression. Industry firsts included outboards with electric starters, folding shafts and, eventually, a two-stroke configuration that generated a thundering 40-hp. In 1933 Bess Evinrude died prematurely and a devastated Ole died the following year. (History generally contends that Ole maintained a sense of optimism and generosity right up until the end, often quietly giving cash to employees and friends suffering Depression-related hard times.) His son Ralph became president of Outboard Motor Corporation, which would eventually become Outboard Marine Corporation. The next three decades brought a sort of super-prosperity. During World War II, Evinrude and parent company OMC switched from manufacturing outboards to the production of bomb fuses, aircraft engines and firefighting equipment. 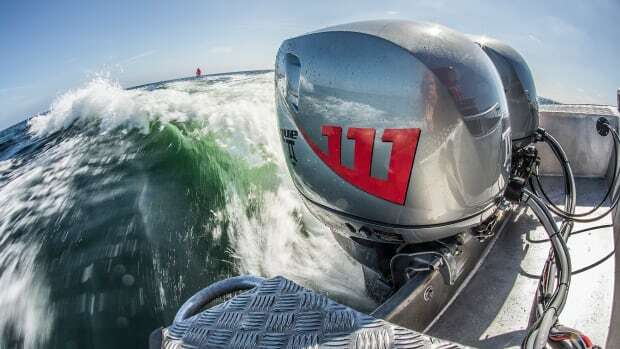 The ’50s saw a spirited return to outboards with the first mass-produced, die-cast aluminum product ever marketed—a four-cylinder, 50-hp powerhouse. And then, as the ’60s and early ’70s arrived, Evinrude and OMC began selling thousands of outboards globally and making money hand over fist. In the fall of 1967, to be specific, OMC reported fiscal-year-end sales that amounted to a whopping $233.4 million. 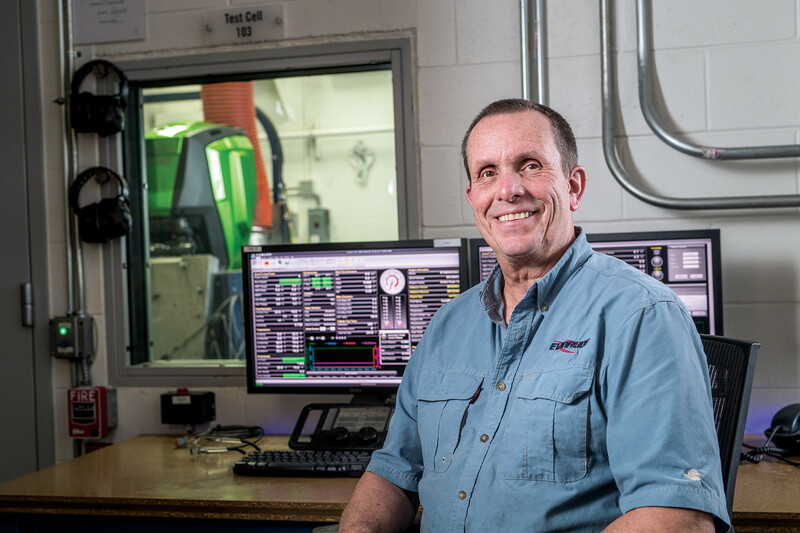 Evinrude’s certified Emissions Testing facility at its global headquarters in Sturtevant stands behind what the company calls “the planet’s cleanest outboard,” its E-TEC G2. But with growth and prosperity came bad business decisions. In 1960, while riding high in terms of profits and reputation, OMC began adding a slew of major manufacturing facilities to its portfolio while diversifying into unrelated manufacturing realms with a riverboat gambler’s insouciance. 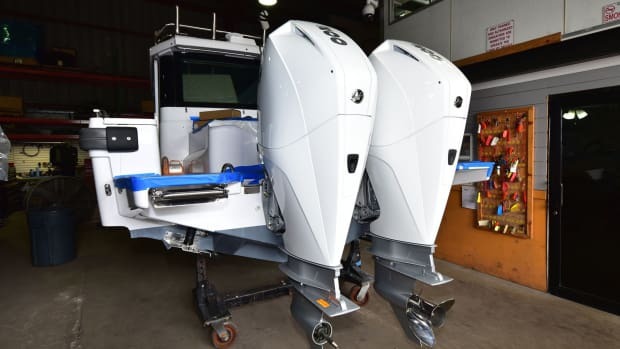 This was especially dangerous considering that OMC was already in full-throated competition with itself, fielding outboards from both Evinrude and sister-company Johnson, products that were stylistically different but essentially the same under the cowling. 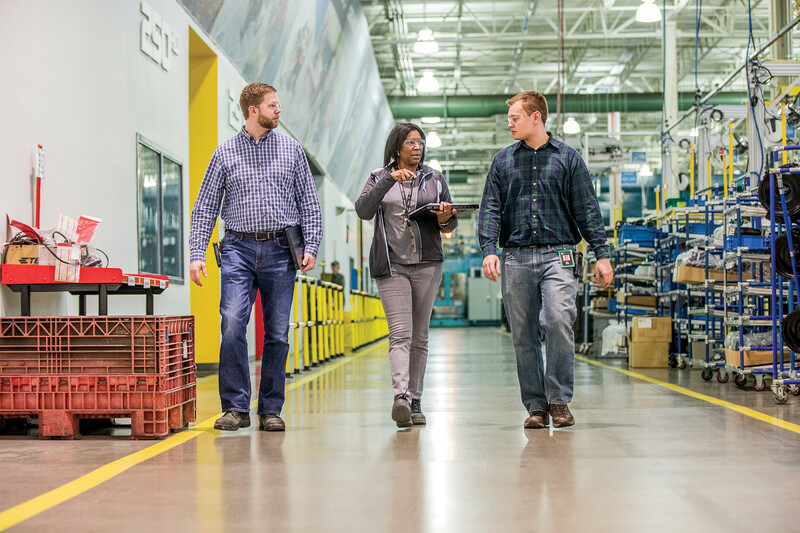 The financial drain associated with supporting separate manufacturing facilities for two virtually identical products—along with separate dealers, marketing departments and distribution networks—was immense. And the rivalry that grew up between the employees who worked for the two, separate product lines ultimately became so intense that a sort of forgetfulness set in concerning competitors (like Mercury and Japan-based Yamaha) threatening from outside the fold. Additionally, due to mismanagement and the inefficiencies inherent in an exceptionally far-flung empire, OMC was having trouble with the boat businesses it had leveraged itself into in order to guarantee transoms for its motors. Top-shelf brands like Chris-Craft, Four Winns and Donzi began losing money. Non-marine products, like snowmobiles, golf carts, chainsaws and motor scooters, were falling short as well. Continuing problems hallmarked the ’80s and ’90s. OMC persisted in building new plants, both stateside and overseas, while high-profile engineering projects failed. 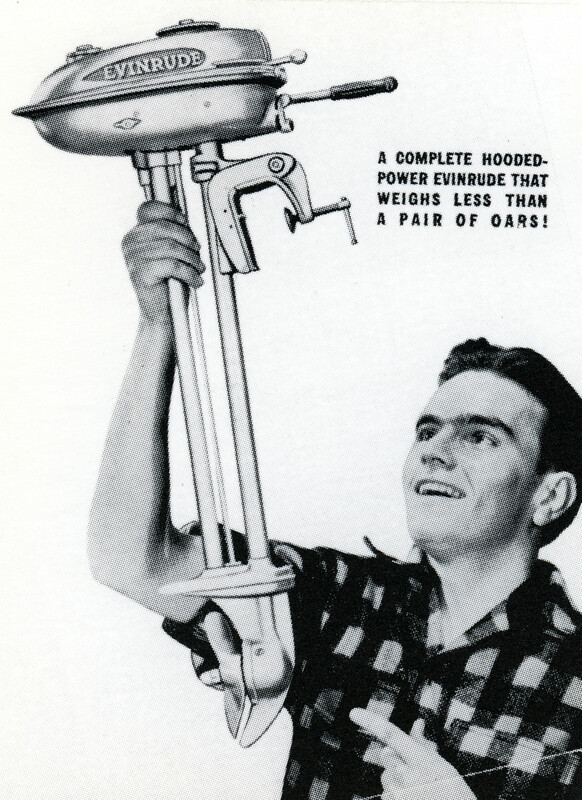 For starters, the introduction of outboard brackets from companies like Armstrong and Gill deep-sixed the so-called OMC Sea Drive—basically an outboard secured to an overly complicated mounting device that was supposed to obviate transom wells and facilitate lifting lower units free of the water. Then a venture into the stern-drive market, where Volvo and Mercury already held numerous patents, proved commercially disastrous. And finally, costs associated with environmental cleanups at facilities in Wisconsin and unionized labor disputes began skyrocketing. Nevertheless, as the new millennium approached, OMC could still claim a third of the entire boat and engine market in the United States, according to BoatUS statistics at the time, and was selling more than 100,000 units a year. It was a lethal duo that finally did OMC in—the Environmental Protection Agency and Ficht two-stroke direct injection technology, or DFI. 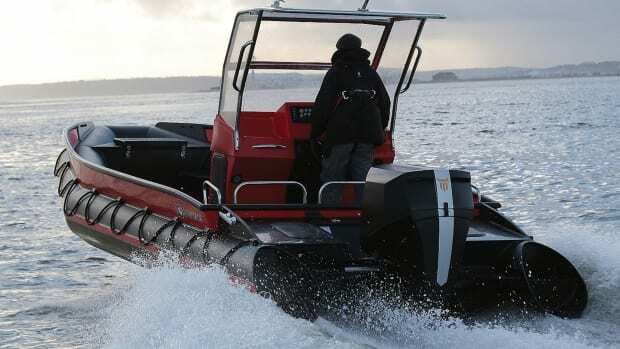 In 1996, with the EPA calling for cleaner, more fuel-efficient outboards, OMC rushed to market with a new two-stroke outboard system called Ficht, after a principal of the German firm that helped develop it. OMC’s honchos were running scared at the time. Competitor Mercury was breathing down their necks with Merc’s own version of two-stroke DFI. And Yamaha already had a few relatively clean-burning, low-horsepower four-strokes on the market. Ficht was actually superb technology. But it required highly controlled and precise manufacturing techniques and tolerances that OMC, once famous for its engineering expertise and innovation, unfortunately no longer possessed. Parts for Ficht products were manufactured in a jumble of separate far-flung, faltering facilities (including a relatively new plant in Mexico) and seldom satisfied specifications. Transportation inefficiencies arising amongst disparate plants and facilities also caused costly and time-consuming delays. So, despite the theoretical solidity of the technology, Ficht was a practical disaster when it hit the market. Motors smoked excessively and knocked. Pistons and rods erupted explosively from engine blocks. Angry customers protested, warranty issues were ignored, sales plummeted and OMC began to fail despite efforts to address manufacturing and other issues associated with Ficht. Today, Evinrude creates its own aluminum cylinder blocks using a lost-foam casting process. The company sources many other components from across the USA. In 1997, Salomon Brothers was hired to explore the possibilities of an OMC merger or buyout. One year later, financier George Soros and Greenway Partners took the corporation private via a $373 million leveraged deal. When OMC filed for bankruptcy only two years later, Evinrude—a legend on the water for well over a century—went down amid a chaotic scramble that would besmirch a grand marque and generate one of the darkest episodes in all of recreational marine history. George Broughton helped develop E-TEC technology from Ficht DFI. What the corporation subsequently did to its dealers and distributors was, in a way, even worse than what it did to its employees, many who’d been on the job for decades. Well before bankruptcy plans were announced, OMC used the promise of lucrative rebates to push an immense inventory of products into showrooms across America, much of it Ficht-based. Unsuspecting business partners were encouaged to buy, buy, buy. Then, once the OMC folded, hundreds of dealers and distributors were left holding the bag, their now-inflated inventories no longer backed by the manufacturer and the promised rebates completely forgotten. In addition, thousands of end-users were left holding the bag as well, with no warranty protection when outboards failed, which they were doing with a vengeance. A procession of possible buyers began visiting OMC’s stalled facilities in Wisconsin. Representatives from Polaris, John Deere, Mercury Marine and other entities stopped by to kick the tires. Of course, Bombardier Recreational Products (BRP), is a spinoff of Bombardier, the Canadian aerospace and transportation multinational famous for building airplanes and fast trains. And not only did BRP purchase Evinrude and add it to its array of recreational products (like Ski-Doo, Sea-Doo and Rotax), it did something else—a very good deed. In an apparent effort to restore public trust in the Evinrude brand, BRP instituted a product recall of defective 200- and 225-hp outboards. Reportedly, more than 11,000 engines were involved. Initially, the Canadians were perhaps more interested in two-stroke Ficht because its advantages over four-stroke technology (superior power-to-weight ratio, extra torque, fast throttle response and acceleration) would boost the performance of their snowmobiles and PWCs. 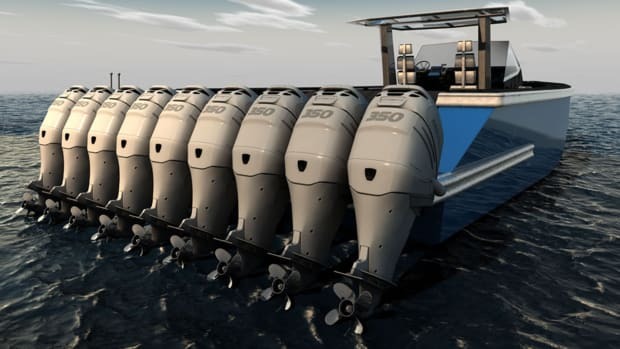 Over the next two years, however, BRP continued to refine and develop Ficht, ultimately bringing it back to the outboard marketplace in early 2003 and calling it E-TEC Direct Injection Technology. 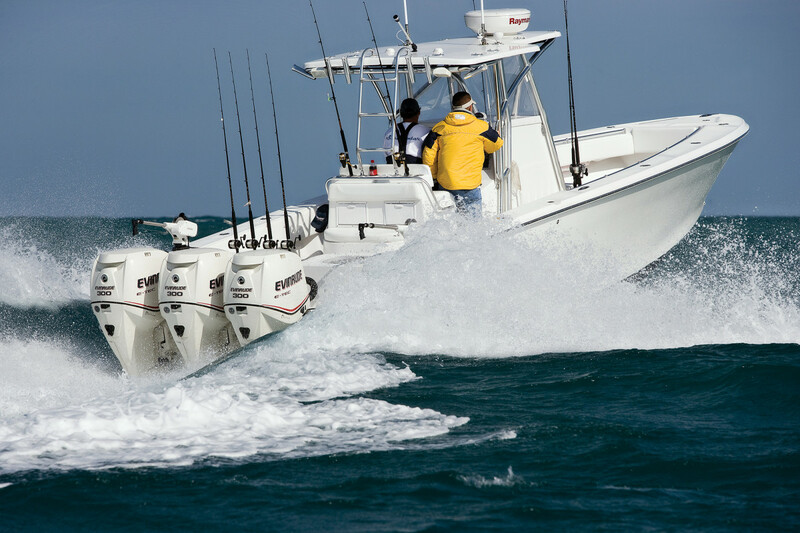 According to company brochures, the relaunch brought the durability, quality and reliability of the new E-TEC outboards up to BRP’s lofty standards. 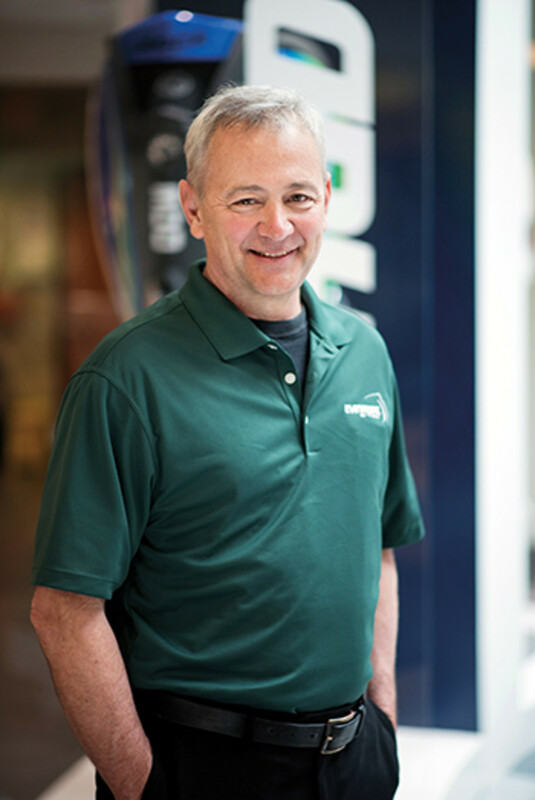 Today, Broughton is director of engineering at BRP and Evinrude outboards are built in a brand-new facility in Sturtevant, Wisconsin. 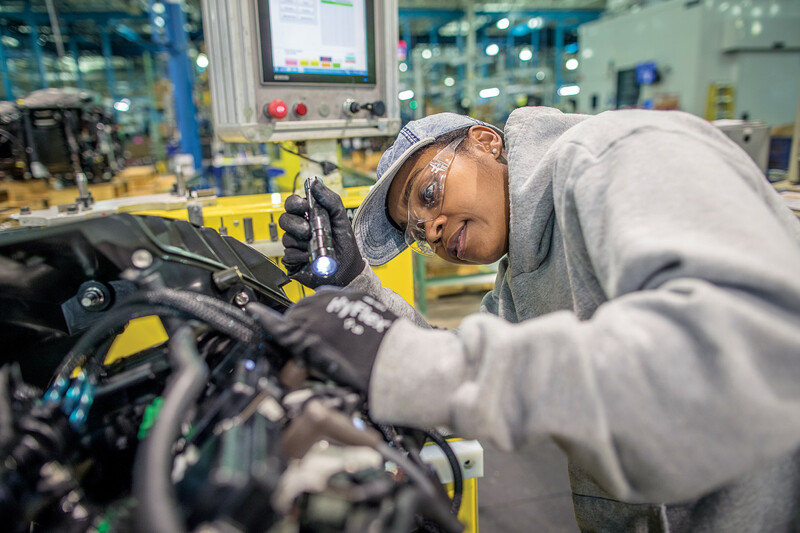 Approximately 300 people work on the shop floor where E-TEC engines are created using components sourced from the plant itself as well as such places as Merrillville, Indiana; Tiffin, Ohio; and Andrews, North Carolina. 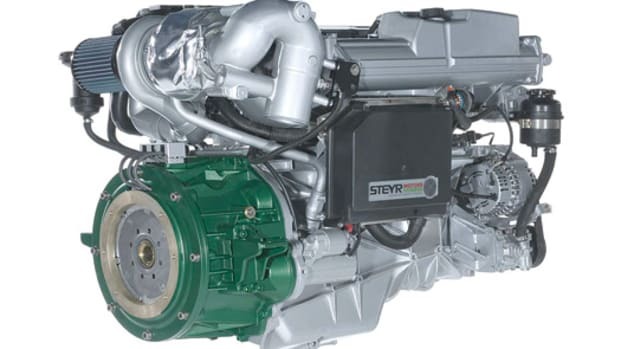 In 2005, Evinrude E-TEC engines became the first outboards to receive the EPA’s Clean Air Excellence Award, thanks to their clean-burning technology. BRP advertises its latest and greatest product—the Evinrude E-TEC G2, a platform with offerings from 150 to 300 horsepower—as “the planet’s cleanest outboard,” with 20 percent more torque, 15 percent better fuel efficiency and 75 percent fewer emissions when stacked up against comparable four-stroke outboards. 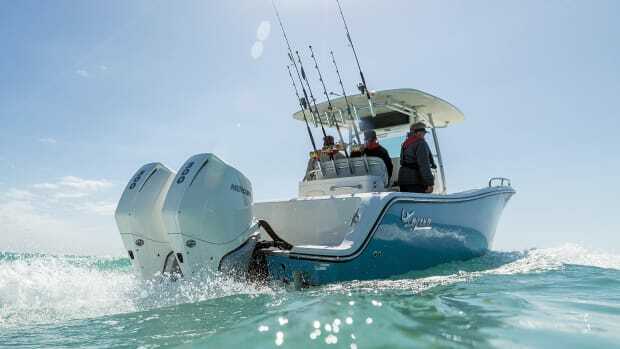 The G2 has fully-integrated, built-in power-assisted steering (with all components salted away inside the engine housing), electronic throttle and shift, and what Evinrude calls “iTrim,” a selectable feature that automatically trims for optimum speed and performance. And hey, it’s got some chutzpah, too. 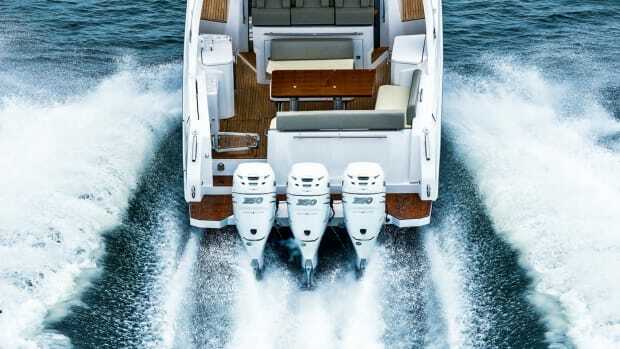 I can swear to it, having recently driven a Yellowfin 36 center console with three 300-hp E-TEC G2s on the transom at a rousing clip of just under 56 knots. That ride, you might imagine, took me back a few years. To that camp my family owned on that spring-fed Adirondack lake. Yup, Evinrude’s come a long, long way from those halcyon days in the early ‘60s. But then again, maybe the fates have simply returned the company to what it used to be—a solid purveyor of waterborne delights. Afterall, is there anything lovelier in this world than zooming across a stretch of open water in a center-console, doing 56 big ones, with a delicious, frothy-white contrail stretching out behind and the wind in your face? If you think o’ somethin’, lemme know!